Stay for the Arty Lounge After-Party, 11pm-2am (19+). 400 Artists/ 25 Locations/ 2,500 attended last year! Celebrating it’s 12th Anniversary year! Experience Thunder Bay transformed by multi-sensory art and unparalleled live performances in this Nuit Blanche-like event. One of the largest presentations of visual and media arts, unique to Thunder Bay. Featuring works by 400 regional, national & international multi-disciplinary artists at 25 downtown locations, including DefSup, commercial art galleries & spaces, artist studios and empty spaces transformed into new art/performance venues. See Wearable Art Window Performances, 9 live bands & DJ’s, Couch Money Karaoke, World Dance Collective Bhangra & Flamenco, Fringe Performance Art, Drag Performances, Belly Dance, Fire & Street performances and Body Suspension. Film & Media Art installations including 190 degree film immersion, Oculus Rift virtual reality experience, Glitch Art video installation, Arduino interactive electronics projects & projection mapping. Artist studios & Commercial Gallery Tours, Interactive Art and Artist Talks, Catered Refreshments by Prime Gelato, The Sovereign Room, HomeSlice Bakery & Sweet Escape Cake Cafe & Bakery and so much more! 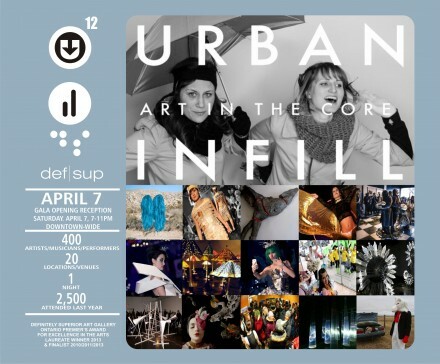 Start at DefSup [250 Park Ave.], pick up your Art Map and let Performative Tour Guides show you the way! You never know what you’ll see downtown! Visual art exhibitions continue: Sun. April 8 to Tues. April 10, 12-6pm. ~Re-discover your north core Waterfront District through contemporary art! Revitalizing our downtown by capitalizing on assets of art and culture and creating connections between empty spaces and existing arts, businesses and social spaces. With an innovative vision of arts and business, we can fill up the empty spaces in our downtown, to create a unique niche of an urban arts in our entertainment district. Awarded Cultural Event of the Year 2017 by the City of Thunder Bay Arts & Culture Awards. Nominated Winner of Best Exhibition in The Walleye Magazine, Best of Thunder Bay Survey 2017.
? What You’ll See ? –12,500 sq.ft. of new exhibition space! LU Visual Art Students, DefSup Members, Die Active/Neechee Studio (new generation art collectives), Confederation College Students Interactive Media Development (Oculus Rift virtual reality installation/try the VR goggles! ), Vox Popular Media Arts Festival (190 degree film immersion! ), Arduino interactive electronics projects (sensors power robots, lights, music, motors), and projection mapping by Doran & Kelly Saxberg. Ahnisnabae Art Gallery, Chenier Fine Arts, Local Colour Art Gallery, New Day Records, St. Paul Roastery, Prime Gelato (Sat-open till 10pm). • The first Tours leave the gallery by 7:50pm. You can also join or leave a tour anytime during the Opening. • Times/locations for special performances are also listed in the Art Map. Hill City Comics, Ahnisnabae Art Gallery, Perfect Fit Lingerie, Mars.Clothing, The Loop, former Teleperformance (Red River Rd entrance). Sam Shahsahabi, Kasia Pieche, Sarah Mason, Shayne Ehman, Lee Gabrielle, Michel Dumont, Hannah Doxtater-Wynn, Caitlyn McMillan, Cree Stevens, boyRoland, Elizabeth Buset, Katie Beda/Dayna Slingerland, Barbara Benwell, Katie Ball- Silver Cedar Studios, Adrienne Kidd. • Couch Money Karaoke (audience participation! @ New Day Records & St. Paul Roastery-lead by Shayne Ehman). • Suspension Serenity: A modern display of ritual flesh suspension. Presented by Holy Scar Body Art with Hook & Dagger. –Special mention to Creation Body Piercing. Lighting by Doran. A physical map of our community showing landforms and waterways, stitched by artist Betty Carpick, will be a metaphor to speak to the fragility, strength and transitory state of our lives and surroundings. Blindfolds optional. *ID required; After-Party Location listed in Art Map- pickup at DefSup 7-11pm. Come at 11pm to catch the performances! Thank you to our Generous Urban Infill Supporters! > Atmos -New Rental Venue- Now Open (211 Red River Rd). Media Sponsors: The Chronicle Journal, The Walleye – Thunder Bay’s Arts & Culture Magazine, LU Radio – CILU 102.7 FM, TBshows.com. Photographers: Flashback Photo, Kirvan Photography, Keegan Richard, Patrick Chondon, Kay Lee, Dan Ventrudo, The Walleye Magazine, DZ Photography & Spun Creative. Performance Sponsors: Silver Cedar Studio, Despres Metal Art Work, Creation Body Piercing, Morgan’s School of Highland Dancing, World Dance Collective. Definitely Superior Art Gallery ? Ontario Premier’s Award for Excellence in the Arts: Laureate Winner-2013 & Finalist-2010/2011/2013 ? Thunder Bay & Northwestern Ontario’s non-profit/charitable Artist-Run Centre for the Multi-Disciplinary Contemporary Arts ? Funders: Canada Council for the Arts, Ontario Arts Council, City of Thunder Bay~Cultural Services, and the generous, arts-supportive people of Thunder Bay ~Engage Art!